FAWCO is a United Nations accredited non-governmental organization (NGO) with special consultative status with the UN Economic and Social Council (ECOSOC). FAWCO's representatives in New York, Geneva, Vienna, Athens, Bonn and other cities attend UN meetings on behalf of FAWCO, focusing on issues related to women and children in FAWCO's priority areas: education, environment, health and human rights. In 2017, FAWCO looked back with pride at 20 years of special consultative status with the UN's Economic and Social Council (ECOSOC). Learn more in the Press Release. 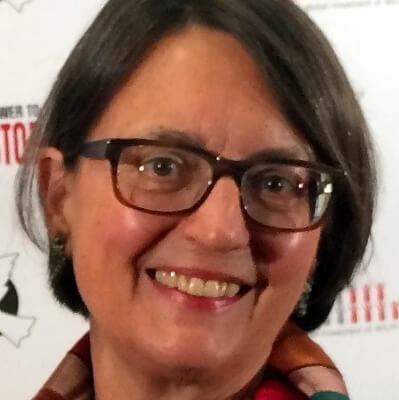 promote the ratification by the US Senate of the UN Convention on the Elimination of all Forms of Discrimination Against Women (CEDAW) and the UN Convention on the Rights of the Child (CRC), and advocate for the inclusion of American women living overseas in the Violence Against Women Act (VAWA). Learn more about FAWCO’s involvement with the United Nations. FAWCO has UN Representatives in New York, Geneva, Vienna, Athens and Bonn, and at-large representatives who attend UN-related events in Paris, Edinborough, Amsterdam and other cities. Learn more about the FAWCO UN Reps Team. As an active stakeholder in the UN NGO community, FAWCO joins other civil society organizations in advocacy statements, position papers and letters to UN agencies and commissions, including the Commission on the Status of Women. Read these statements. FAWCO’s commitment to working with the UN began in 1993. Read the history of FAWCO at the UN. FAWCO's UN Reps collaborate with FAWCO’s Global Issues Teams, Target Program and Youth Program, focusing on raising awareness and sharing information about the UN Sustainable Development Goals and other initiatives, promoting action, and participating in global campaigns. Learn what FAWCO’s UN Reps are doing in the area of education. Learn what FAWCO’s UN Reps are doing in the area of environment and climate change. Learn what FAWCO’s UN Reps are doing in the area of global women’s health. Learn what FAWCO’s UN Reps are doing in the area of human rights for women and girls, and read reports from FAWCO’s Representatives at the UN Human Rights Council (HRC) in Human Rights Council Blogs. Learn what FAWCO’s UN Reps are doing in the area of migration. Learn what FAWCO’s UN Youth Reps are doing. FAWCO’s mission is to improve the lives of women and girls worldwide, so Gender Equality is our highest priority. Learn about FAWCO’s work at the UN in the area of Gender Equality. FAWCO’s UN Reps participate actively in NGO Committees on the Status of Women in New York, Geneva and Vienna. A delegation of UN Reps and FAWCO members attend the UN Commission on the Status of Women (CSW) each year. We co-sponsor Written and Oral Statements that are submitted to CSW (see more in Advocacy) and organize NGO Forum events. 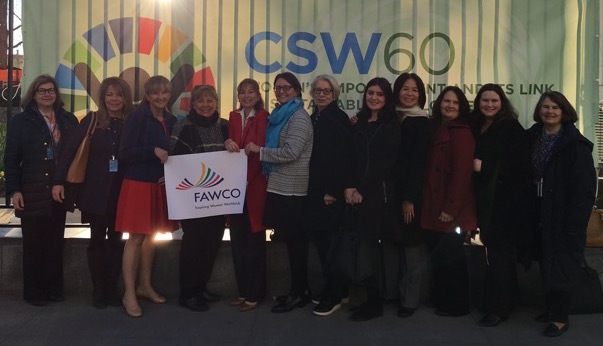 Learn more about FAWCO at CSW and read blogs by FAWCO CSW delegation members on the CSW Blog. FAWCO’s UN Reps Team and UN Liaison publish periodic UN Liaison Bulletins to inform our members about current priorities at UN Women, in the NGO Committees on the Status of Women, the Human Rights Council, the NGO Committee on Migration, the UN Refugee Agency (UNHCR), the UN Climate Change Conference (UNFCCC), UN Educational, Scientific and Cultural Organization (UNESCO), UN Department of Public Information, and much more. Find current and past UN Liaison Bulletins and the link to sign up to receive the UN Liaison Bulletin (for logged in FAWCO members only). You will also find the UN Reps Team Annual Reports for FAWCO, as well as reports submitted to the UN Department of Public Information and UN ECOSOC. See these reports.